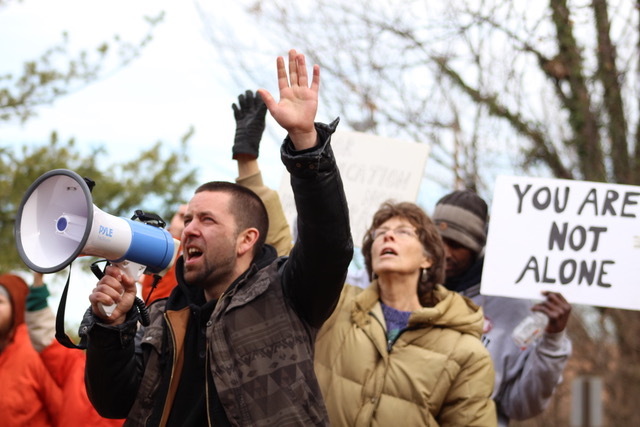 Activists show solidarity outside largest women’s gaol in Washington DC. 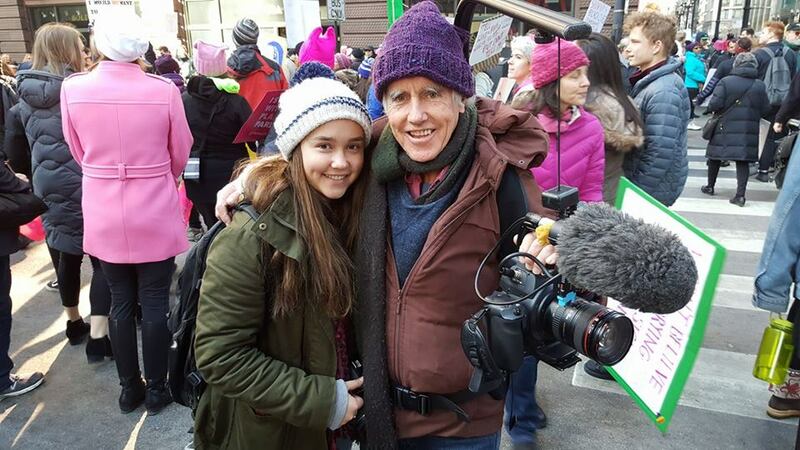 Nicky and David at Women’s National march day in Chicago – January 2018. 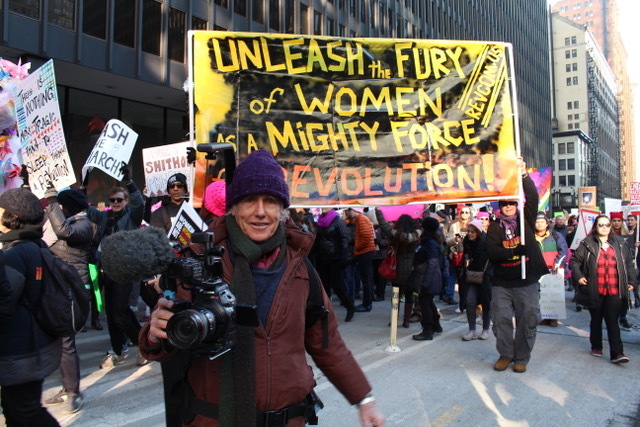 David in the streets with ‘his sisters’ who numbered 300,000 in Chicago – January 2018. David Bradbury was recently in the US again with his camera rolling in eight cities across America for the making of the sequel to America & Me. One year into Trump’s administration Bradbury reports back – he has never seen American society so explosive. “This northern summer and the remaining three years of Trump are going to be explosive, potentially similar to the US of the 1960s,’ the veteran filmmaker says. Bradbury filmed and interviewed senior Black Lives Matter activists on Martin Luther King day, anti-war veterans of American’s failed wars-of-empire in Vietnam, Iraq and Afghanistan and the building of the Wall on the US/Mexican border where Latino migrants daily are frog marched across and deported in tears. 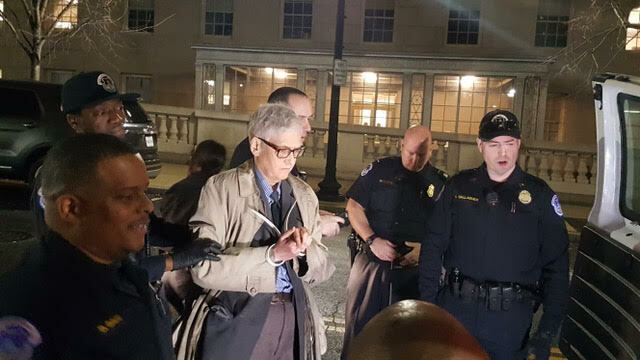 He filmed anti-torture activists outside the White House clad in prison orange jumpsuits with black hoods over their heads demanding the release of 41 Muslim political prisoners still held and tortured at Guantanamo, most of them uncharged and untried. Bradbury’s camera rolled as anti-war activists stormed into the Congress office of Democratic Whip Steny Hoyer who supports the Saudi’s bombing and torture of students and farmers in Yemen. David Bradbury has collected stories and interviews with activists that inspire hope that arise out of a dark winter in America. Funds are now needed to bring these stories to light. Frontline Films has been at the forefront of cutting-edge documentary making for 30 years. David Bradbury is a legendary documentary maker and always fearless to get to the heart of what is happening. Just prior to him leaving for the US, he previewed America and Me to packed out houses. HELP GET THE TRUTH OUT with your tax deductible donation. Target of $50,000 will get doco to screening stage. David films ‘Rebecca’ who explains why she is marching in the streets against regressive and sexist politics of the Trump Administration. 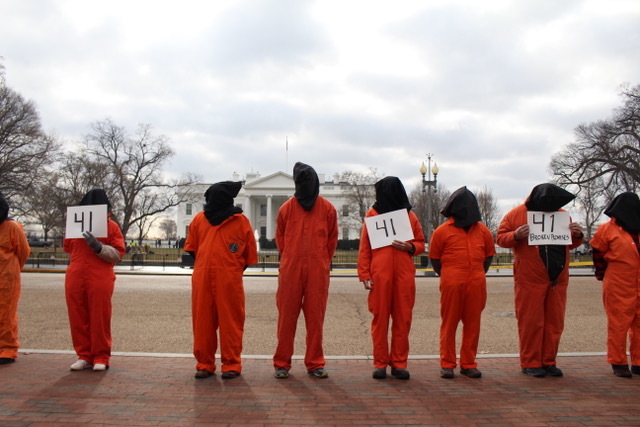 Activists from Witness Against Torture line up outside the White House in DC symbolising the 41 Muslim male political prisoners still held at Guantanamo, most without charge.